Glance at this disc from the Meridian Arts Ensemble and you might think that it was a straightforward disc of renaissance music played by brass ensemble, but listen to the first track and the presence of a vibraphone in the arrangement of the Gloria from William Byrd's Mass for Five Voices makes it clear that the disc is something slightly different. Entitled Alchemy, the Meridian Arts Ensemble presents music by Byrd, Gesualdo, Carissimi, Lassus, Corelli, Dufay, Gabrieli, and Bach in arrangements by Adam Unsworth, Raymond Stuart, Daniel Grabois, Dave Ballou, Jon Nelson, Elgar Howarth, on the 8bells label. The Meridian Arts Ensemble on this disc consists of Jon Nelson and Tim Leopold (trumpet), Daniel Grabois (horn), Benjamin Herrington (trombone), Raymond Stuart (tuba) and John Ferrari (conductor/percussion), plus a number of guests Dave Ballou (trumpet), Faustino Diaz Mendez (trumpet/trombone), Gustavo Rosales Morales (trombone), and Adam Unsworth (horn). And in fact most of the arrangements are done by performers on the disc. Despite the addition of the vibraphone, the opening Gloria by Byrd is a sensitive and interesting version, and it certainly showcases the finely intelligent playing of the performers. Each individual line is nicely characterful but the whole has a sensitive balance. They do not try to be something they are not, this is no pseudo historical disc but a modern re-creation done sensibly. With music by Carissimi (from Jephthe) and Gesualdo (one of his madrigals) hardly any arrangement needs doing such is the strength of the original music. And the Gesualdo certainly sounds very modern, and in fact there are moments in the Carissimi which do too. Lassus's tiny Eco is full of delight as two ensembles answer each other, whilst his Providebam Dominum is a sober and moving evocation of his polyphonic motet style. The transformation of Gabrieli's Sonata Pian'e Forte into music for modern brass ensemble is similarly straightforward and we can admire the nice musicality of the performance. With Sonata VIII by Dave Ballou based on Corelli we enter a different world. Ballou is a jazz trumpeter and here has written a rather striking modern piece based loosely on Corelli's Sonata VIII for violin and keyboard. It is beyond arrangement, and develops into something rather striking in its own right. The various movements from it thread their way through the disc, providing us with intriguing glimpses of the whole. Elgar Howarth's Pasce Tuos utilises a different sound world but the ethos is the same. Howarth has taken a snippet of Dufay and developed it into a magical and austere piece. Jon Nelson has arranged the six part fugue from Bach's The Musical Offering, and Nelson has taken great delight in utilising as wide a range of timbre as possible in the music. Nelson's arrangement of Contrapunctus XV takes similar route and both pieces evoke distinguished 20th century re-workings of Bach without ever losing sight of the original composer or his musical argument. All this would not work unless the playing wasn't spot on, and it certainly is. 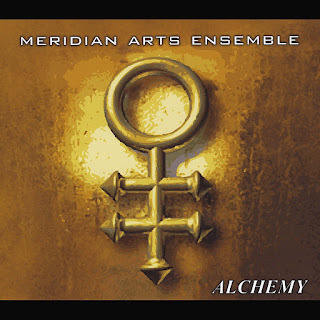 The Meridian Arts Ensemble is a New York based group whose career goes back to the 1990's and whose repertoire is highly varied and stretches well beyond the music on this disc. But here they bringing a nice sensitivity, intelligence and alchemy to the music, and we can not only appreciate their skill but can listen to the music with great enjoyment. The disc was in fact issued in 2013 and may be a bit of a challenge to acquire affordably in the the UK but is certainly worth seeking out.